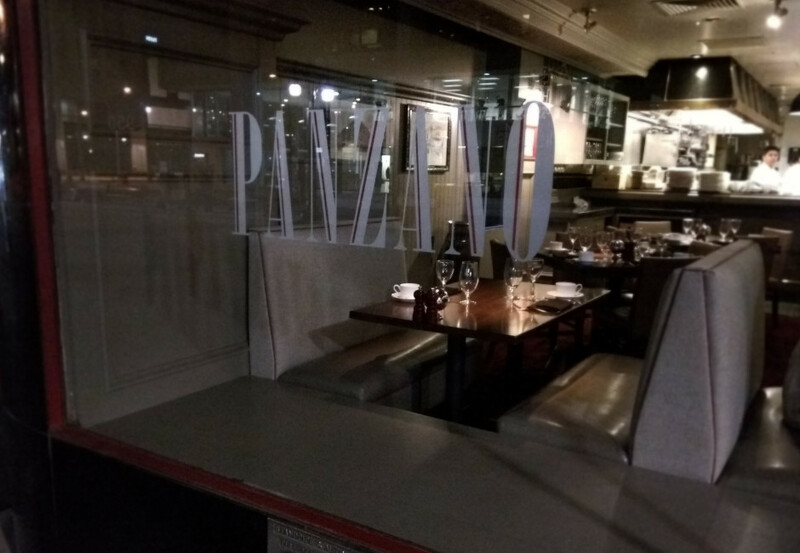 The Restaurant Panzano in Downtown Denver has a shining reputation. From chefs to restaurateurs, everyone I spoke to had great things to say about them. Which is why we were thrilled when they called us about recovering their booth seats for a remodel. Restaurant remodels can happen in several different ways. Sometimes we work a few hours for several mornings before the restaurant opens. Completing sections until everything is done. However, Panzano is open for breakfast at 6:30am and that method wasn’t an option. So, their GM requested we work overnights while they were closed. We came in and completed a free estimate. Since they were working with a designer we were sure to estimate the required booth seat, back and, trim materials. Once we received approval we worked with the designer to ensure that the specific amount of material would meet the requirements of patterning. When the materials arrived we immediately began patterning so that the time required on site would be the absolute minimum. 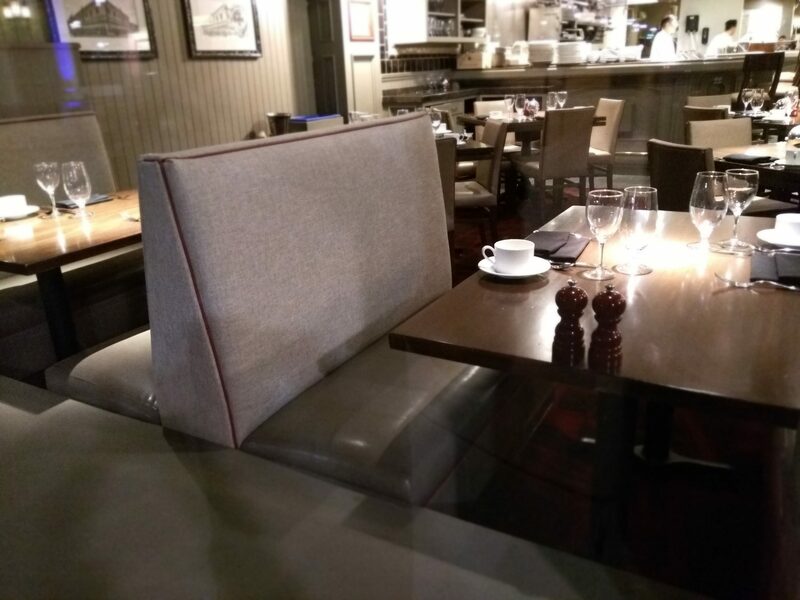 We made a few trips to the restaurant while doing so to make sure that the booth seat end caps would be correct and that we had everything measured correctly. 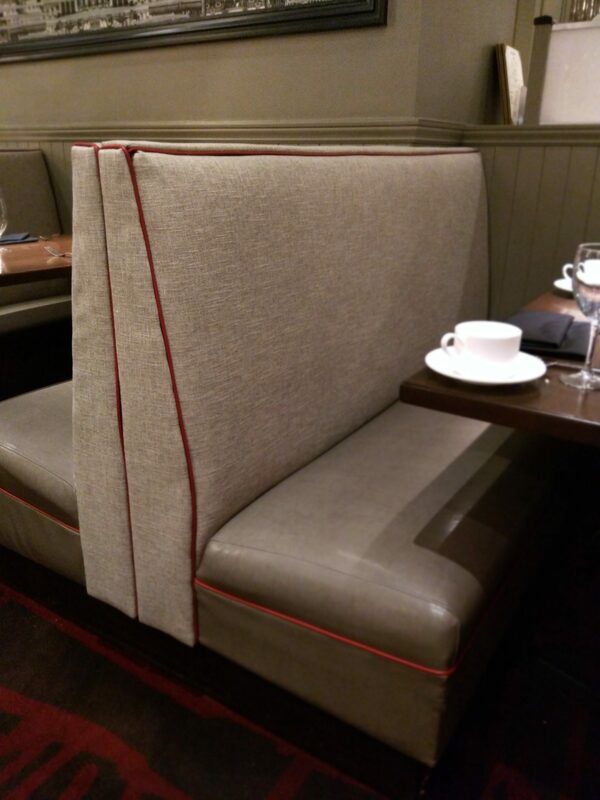 We pride ourselves on accuracy and wouldn’t want to be completing a restaurant and ever have to leave something undone! We worked with the management on the specifics of what sections needed to be done and when in order to maximize our efficiency every night. We arrived early at the restaurant and staged the tools and materials so we could begin immediately at close. We worked diligently, for three nearly 12 hour shifts, until everything was complete. You can see the quality of our work. And we are proud of the results! With our unique approach to upholstery there’s no need to wait weeks or months to get your restaurant updated. Total time for this job from when the material arrived to when the job was completed was 1 week and 1 day.